The Ice Hunter Minnow is a great spoon to use under the ice. It has a slow fluttering, gliding action on the fall. It works great for a wide variety of fish, from perch, crappie, splake, steelhead, whitefish, walleye and many others. 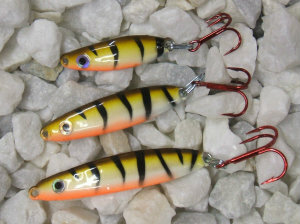 Even though this lure is mainly an ice fishing lure, it can also be effective snap jigging in open water.